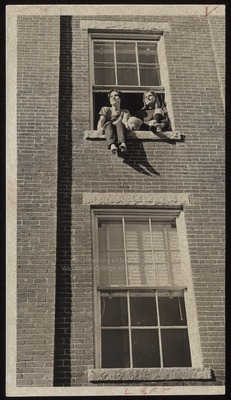 "Debbie Falvey and Jan Smith, Westbrook Junior College, March 1970"
Two Westbrook Junior College students dangle their legs out of a Hersey Hall dormitory window in this March 1970 sepia toned photo with Press Herald stamped on the back. Freshmen Debbie Falvey of Worcester, MA. and Jan Smith of Glastonbury, CT. soak up the sun's rays in this "sign of spring" photograph which may have been printed in the Friday, March 20th, 1970 Portland Press Herald.